The International Domestic Workers Federation (IDWF) has been selected as one of the 12 Winning Changemaker Organizations of the Challenging Norms, Powering Economies Initiative by Ashoka, Open Society Foundation and UN Women. an initiative of Ashoka, Open Society Foundation and UN Women. The Challenge Fund, which will cover her travel to and from Johannesburg and accommodation within. An opportunity to develop her ideas further and to resubmit her application to be selected as one of three final winners and be eligible for larger cash prizes. Let 's celebrate this initial success and hope that will inspire more women to do the same - to challenge norms and to power economic rights of all women, including domestic workers! Congratulations Myrtle! 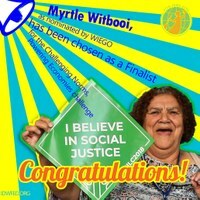 Congratulations to WIEGO, Congratulation to IDWF!